Camps will run from the 28th to 30th of October (Tuesday to Thursday) from 10am-2pm daily in Athboy RFC, Cill Dara RFC (boys and girl’s camp), Donnybrook, Gorey RFC, Tullamore RFC and Westmanstown RFC. 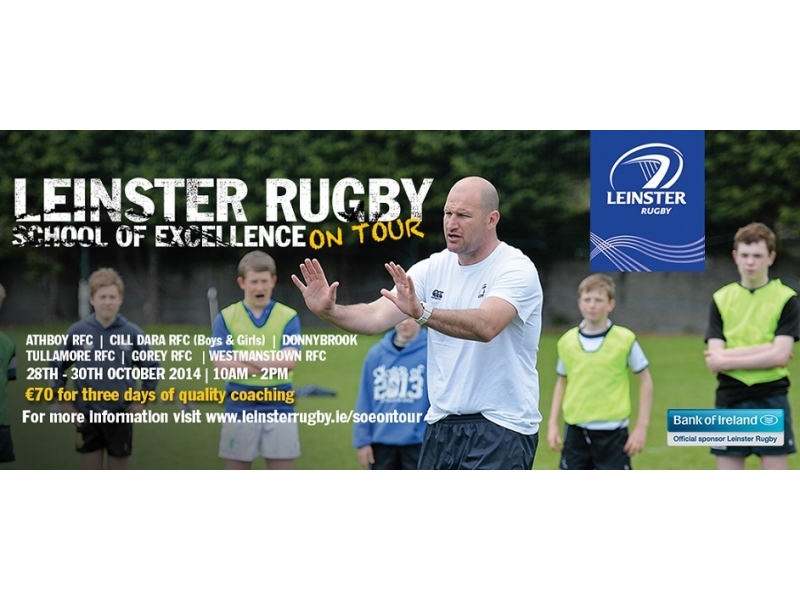 Leinster School of Excellence on Tour is designed for players aged between 10-16 years old who want to learn to play rugby the Leinster Way. Players who participate in the camps will develop their skills, obtain a greater understanding of game awareness and learn about rugby values such as team work, commitment, integrity and communication. Participants will receive a Leinster Rugby Canterbury of New Zealand contact top as well as a nutritional talk and further education on strength and conditioning appropriate for each age group will be provided.